CAIRO: Egyptian President Abdel Fattah Al-Sisi has been re-elected for a second term with about 92 percent of the vote, preliminary results showed yesterday, with just over 40 percent of voters casting ballots. Twenty-five million of the 60 million registered voters, or some 41.5 percent, turned out during the three days of polling that ended Wednesday, state-owned newspaper Al-Ahram reported. Twenty-three million voted for Sisi. The Akhbar el-Youm newspaper did not report the full turnout but said Sisi won 21.4 million votes, and his rival Moussa Mostafa Moussa 721,000 votes, without mentioning the number of spoiled ballots. According to Al-Ahram, in addition to 23 million who cast valid votes, two million spoiled their ballot papers. Sisi’s sole challenger was the little-known Moussa, himself a supporter of the president, who registered immediately before the close date for applications, saving the election from being a one-horse race. Moussa conceded his loss on Wednesday night, telling a television station he had hoped for 10 percent of the vote. “But I know the immense popularity of President Sisi,” he said. Other, more heavy-weight would-be challengers were all sidelined, detained or pulled out. Sisi, who as army chief ousted Egypt’s first freely elected president- Islamist Mohamed Morsi-after mass street protests in 2013, won his first term in 2014 with 96.9 percent of the vote. 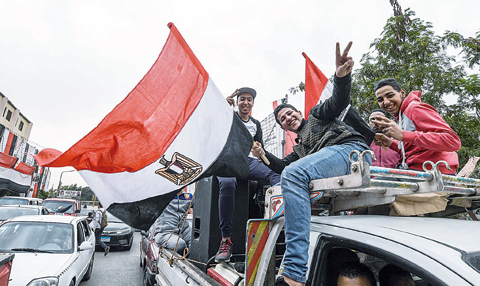 Turnout of 47 percent in that year’s election was sharply higher than this year’s 40 percent despite appeals from Prime Minister Sherif Ismail for voters to fulfill their patriotic duty. Boycotters who cannot show good reason for not going to the polls could a face a fine of up to 500 Egyptian pounds (22 euros), the electoral commission has warned. At a news conference, election commission official, Mahmud al-Sherif, said there had been no violations of Egypt’s election law. Opposition groups had called for a boycott of this week’s vote which they labeled a facade. There were no presidential debates and Sisi himself did not appear at any official campaign events, although he spoke at a number of ceremonies. In an interview days ahead of the vote, Sisi said he had wished there were more candidates, denying any role in sidelining them. At a speech before the vote he also called for a high turnout. “I need you because the journey is not over,” Sisi told a mostly female audience. “I need every lady and mother and sister, please, I need the entire world to see us in the street” voting. Morsi’s removal had ushered in a deadly crackdown that killed and jailed hundreds of Islamists. The initial crackdown on Morsi’s supporters expanded to include liberal and leftist secular activists A jihadist insurgency since has killed hundreds of policemen and civilians. Sisi gave the armed forces and police a three-month deadline in November to wipe out the Islamic State group in its Sinai Peninsula stronghold. The deadline has since been extended, and on February 9 the armed forces launched their most comprehensive campaign yet to end the five-year-old jihadist insurgency. But attacks by the jihadists have continued.